Hello. A short time back, a fellow wanted to sell a Bersa Series 95 that he had purchased new and had fired but 200 factory rounds through. It would come with one extra magazine at what I thought was a fair price. 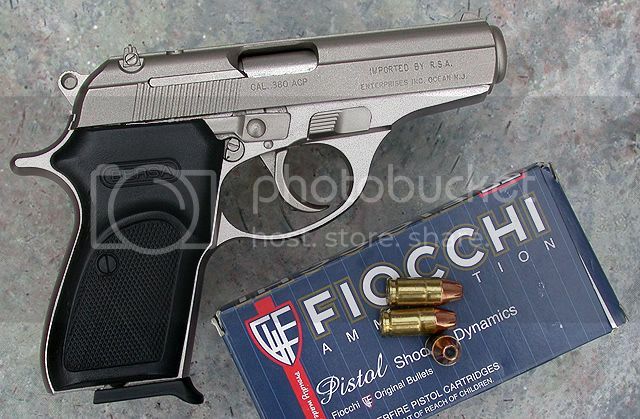 The pistol was as described and he tossed in a box of Fiocchi 90-gr. JHP ammunition. This is the pistol and ammunition perchased. The gun came with an extra magazine. Based only on visual examination, that Fiocchi JHP ammunition sure looks like the bullet is Hornady's (excellent) XTP, but I've not checked that assumption for accuracy...yet. Series 95 vs. Thunder: The guns are quite similar including both magazines, grips and grip screws. Most obvious is the Series 95's lack of a hooked trigger guard, something I prefer, and the lack of verticle grooves on both the front and rear grip straps. The entired Series 95 appears to be electroless nickled where my Thunder has the dark finished slide and small parts. Sights appear the same on both. The rib atop the Series 95 has horizontal striations only, unlike the fine knurling on the Thunder's rib. Trigger pulls on both pistols were equivalent and both have the magazine disconnect. 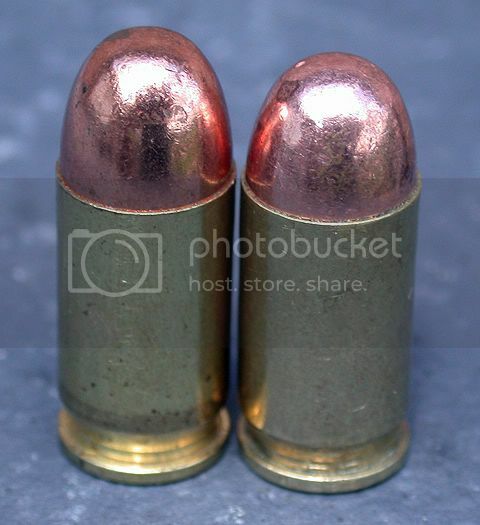 Both guns "felt" the same except for the lack of vertical grooves on the Series 95. 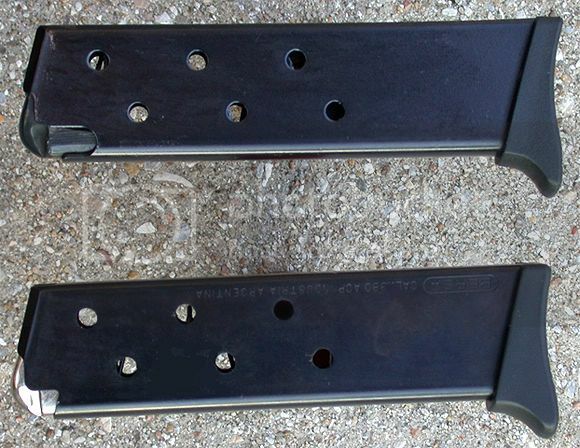 The magazine floorplate is slightly different than that of the Thunder's magazines, though my extra magazine's appeared to be identical. I figured that there wouldn't be much if any difference in shooting between the Series 95 pistol and the Thunder. 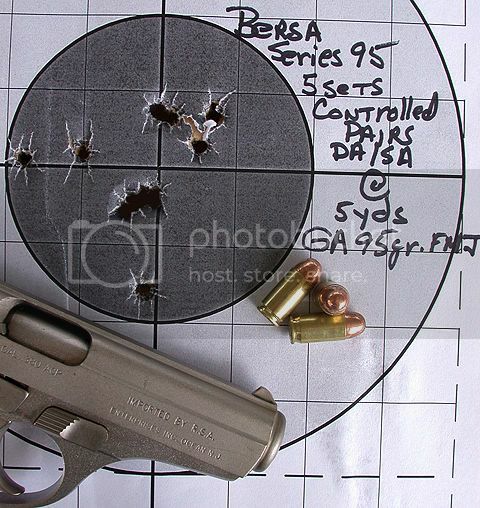 Shooting: Shooting was done at varying distances not only to check accuracy but handling potential. The latter will always have some degree of subjectivity present as what feels "right" to one person, might not to another. Most shots were fired from a standing position using a two-hand hold. A few groups were fired seated with braced wrists. 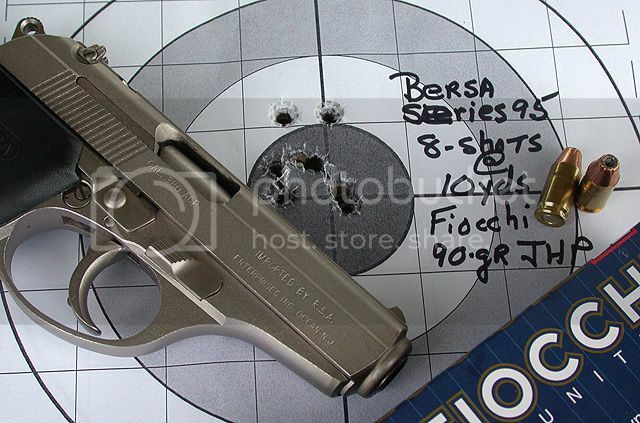 Eight shots of the Fiocchi 90-gr. JHP grouped nicely in this off-hand group at ten yards. Each of these shots was fired from the single-action mode and in slow-fire. Federal's 90-gr. "Classic" JHP grouped very nicely from the pistol. This 15-yard group was fired from a seated position and in slow-fire with my wrists braced. Each shot in this group was fired double-action. I simply decocked between shots. They were fired from a standing position with a two-hand hold. Not slow-fire but fired at a fairly rapid cadence when a "flash sight picture" was obtained. Fired from a standing position and using a two-hand hold, five sets of controlled pairs were fired. The first shot was fired double-action with the follow-up in single-action. Starting from a low ready position, average time was 1.41 seconds, quickest being a couple of hundreths less with the longest being about 1.7 seconds. I have little doubt that others can certainly do better, but I think this is fairly representative of my limited abilities with the little shooter. Ammunition used was Georgia Arms' 95-gr. FMJ sold under their "canned heat" label. 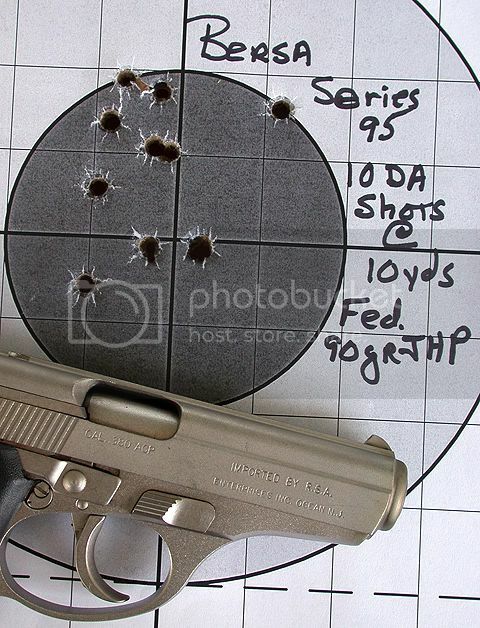 I finished up with a 15-yard group fired off-hand and standing with a two-hand hold with some older Federal 90-gr. HydraShoks I happened to have. Observations: When cycling the slide by hand to chamber rounds, all of the ammunition listed above fed smoothly. Ejection was positive and primer strikes were nicely centered and plenty deep for reliable ignition. I had expected flawless function as has consistently been the case with my Bersa Thunder. I did not get it. There were numerous failures to feed (always the last shot) and frequently the slide did not remain locked back after the last round was fired as it should. Sadly, this was frequently the case when the gun tried to chamber the last round in the magazine. Interestingly, neither of these malfunctions occurred with the Fiocchi JHP. I began to compare some of the ammunition. On the left is Remington UMC 95-gr. FMJ having a LOA of 0.975". 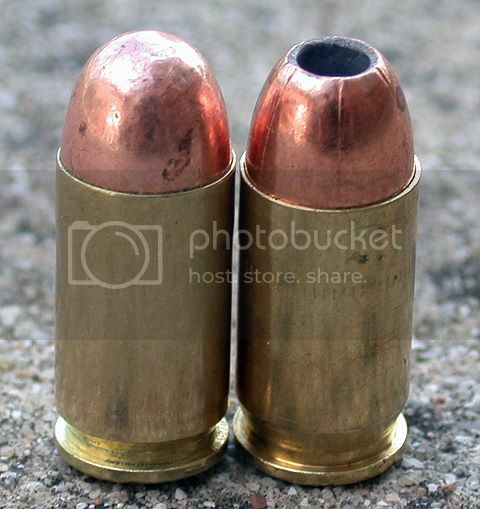 On the right is GA's version at a shorter 0.940". Shown here is Federal's 90-gr. JHP, which had the shortest LOA, measuring 0.927". I figured that this little gun simply preferred ammunition within a tight range of lengths overall. Wrong! I am embarrassed to admit that I did not note the culprit until cleaning the Series 95 that evening. The top magazine is the extra that came with the gun. While it resembles the Bersa factory magazine shown below, it is not and has been relegated to "File 13". Note that the factory magazine has printing visible on it and that the aftermarket doesn't. The non-factory magazine in this case also had a dark-colored follower. 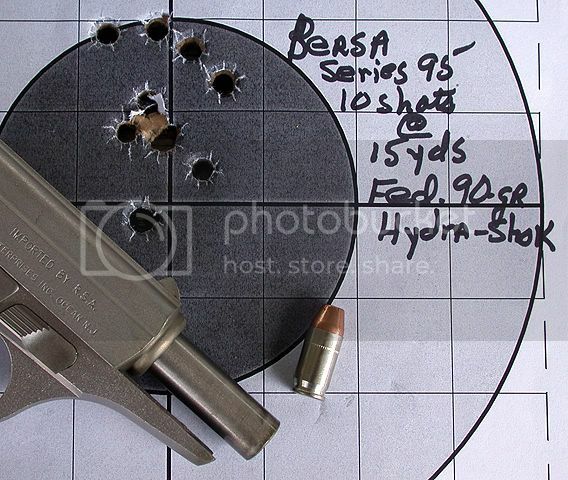 I tried the gun with this factory magazine and two other extra Bersa magazines I had at hand and as with the nickled magazine that came with the pistol, function was now 100%. Excepting the poor performance from the aftermarket magazine, shooting results and reliability in the extreme were about as expected. I have heard/read that some folks consider the Bersa .380's to be "junk pistols". I do not. I have had and continue to have very good luck with the one I've owned for several years now and expect to do the same with the Series 95. 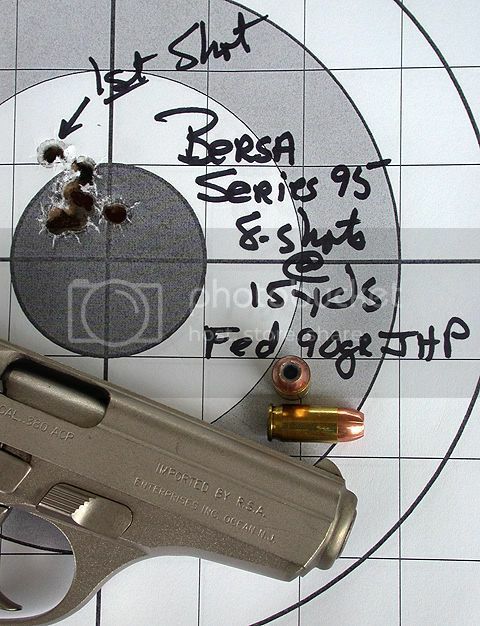 As has been the case with my Bersa Thunder (and quite a few I've seen shot at various CHL qualifications), this pistol is proving itself reliable in the extreme, an essential characteristic for any firearm intended for self-protection. POA closed matched POI at the distances I shot the gun and I made zero horizontal changes to the rear sight; it remains centered. I will be hanging on to this little popper just like my Thunder. I have couple of other more pricey 380's lying about and I enjoy shooting them to be sure, but I enjoy the Bersa's just as much. 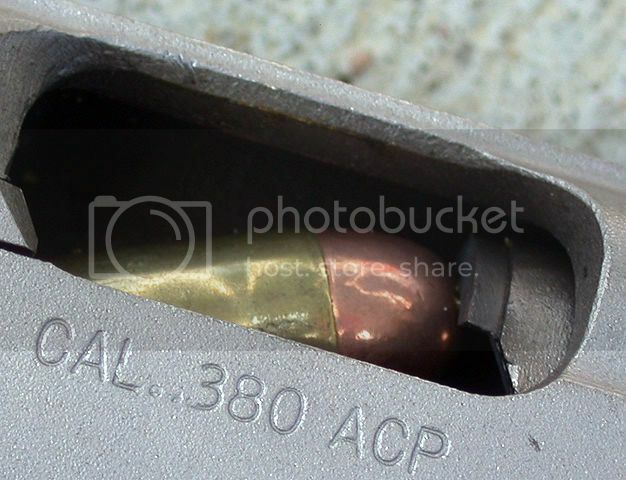 Now and again, I'll find myself toting a .380 ACP pistol, either as a backup or by itself when nothing more can be had. In the past, it somehow always wound up being the little Thunder. Now it will be either the Bersa Thunder or the Series 95. I really like 'em both. Nice report. I've got the Bersa Thunder DLX model with the 9 round mag. Bought it at a Gander Mountain for the same price as a regular BT because they were out of stock. Mine has been flawless through abot 1000 rounds. Good little guns and easy to carry IWB.